A perfect way to continue with your Skin~tegrity Facial Regimen while on the road! Lovingly packaged in a convenient, TSA-friendly travel size kit! Our best-selling intensive, biologically active facial care line is now available in an approximately 2-week supply. What Skin~tegrity is: Skin~tegrity is purposefully formulated with Organic Ingredients to achieve Noticeable and Positive Skin Improvements, Reduce Fine Lines and Wrinkles, Firm and Brighten your Complexion, Promote Collagen Production, and Restore Youthful Complexions! What the Skin~tegrity Travel Kit does: This kit offers you a way to take your perfect skin care regimen with you, without the need to pour your products into smaller bottles or pack the larger bottles into your suitcase. You will have everything you need while away from home to help your skin cope with the stress of travel! Who will use the Skin~tegrity Travel Kit: We all travel, whether with work or even better, for pleasure. Now you won’t be tempted to reach for products supplied by hotels or be required to hit the store when you arrive at your destination to purchase unfamiliar products that might be wasted when you leave them in your hotel. 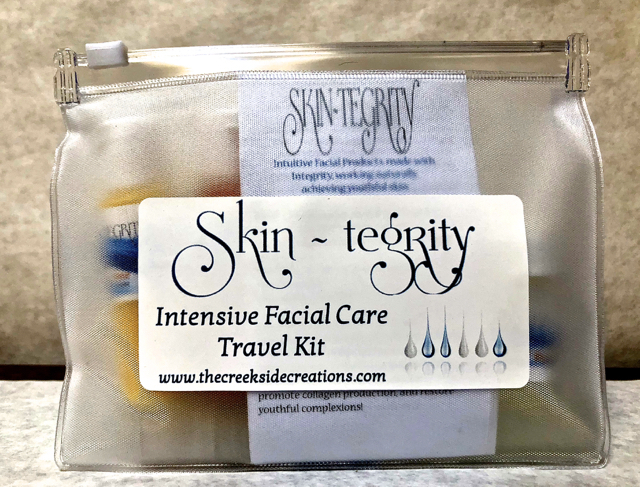 Click the button below to add the Skin~tegrity © Intensive Facial Care Travel Kit to your wish list.